In the context of Smule, I was meeting with the director of digital media for the San Francisco Opera a week ago. We were talking about potentially collaborating with the SF Opera and Smule's Sing! Karaoke product. Wouldn't it be amazing if you could sing with the acoustics of the SF Opera hall, with the SF Opera orchestra? And wouldn't it be more amazing if you could actually sing with some of the top artists in the world? We shall see. Anyway, I was reminded of how much I adore Puccini arias (guilty as charged), and so sat down and recorded O mio babbino caro this morning. I performed this alongside selections from Strauss and Schubert with a friend over the past couple years. My Schumann episode continues, this time with Brahms Opus 116 No. 4. Such a sweet piece. One analysis of the piece (that I freely borrow from Professor Barth at Stanford) proposes a dialog between tenor and soprano. We see the clues in the opening of the piece. The tenor has a piano dynamic and wedge on the ascending chromatic motion through B-sharp to C-sharp, whereas the dolce response of the soprano has descending fifths and sixths, eventually with descending motion to G-sharp. Of course C-sharp is a third below the home key of E, while G-sharp is a third above. We see the recurring passage built on this opening tenor gesture at mm 32-36 where we arrive at G-sharp, and then again at mm 49-52 where this second time we arrive at C-sharp. 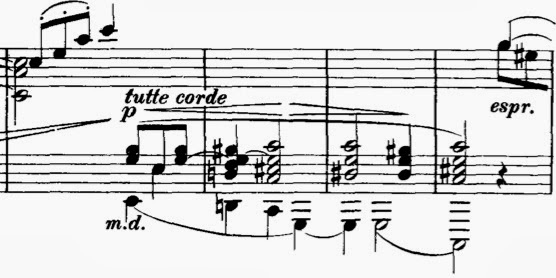 I won't elaborate on the arpeggiated una corda section starting at m 36 with the melody in octaves plus a sixth, including the pronounced ben legato, but leave that to the imagination of the reader. Eventually, and once again through with ben legato gestures, the two separate voices finally converge (merge?) on E, coinciding with the arrival of E as the harmony at m 67. I appear to be going through another Schumann period (episode?). I went back and started reading some of his KinderSzenen a day ago. I decided to record the Kind in Einschlummern this afternoon. I first did a recording via iPhone in the Smule Sing! Karaoke App. I then used a better recording device for this second recording, link below. The scenes from childhood are easier pieces but, not to be confused with his Album für die Jugend (Album for the Young), were not written for children per se. The titles to each song, like much of Schumann's work, apparently came late. I suppose you shouldn't read too much into any of the titles other than to explore more ideas of how to interpret each piece. Yet this song, and taken in from the whole cycle, certainly seems to suggest that the days of innocent youth are nothing more than reminiscences now.